The generation of induced pluripotent stem cells (iPSCs), especially the generation of patient-derived pluripotent stem cells suitable for disease modelling in vitro, opens the door for the potential translation of stem-cell related studies into the clinic. Successful replacement, or augmentation, of the function of damaged cells by patient derived differentiated stem cells would provide a novel cell-based therapy for diseases. Since iPSCs resemble human embryonic stem cells (hESCs) in their ability to generate cells of three germ layers, patient-specific iPSCs offer definitive solutions for the ethical and histo-incompatibility issues related to hESCs. Indeed human iPSC (hiPSC)-based autologous transplantation is heralded as the future of regenerative medicine. Figure 1: Patient induced pluripotent stem cells (iPSCs) represent an unprecedented tool for the generation of in vitro platforms for disease modelling and the definition of protocols for pluripotent stem cells differentiation. Transdifferentiation also offers the possibility to generate auto-compatible cells with no need to undergo to pluripotent stage. In these scenarios the correction of the genetic defect(s) leading to disease may help to understand the molecular and cellular mechanisms driving disease gestation and progression, and more importantly, to identify novel mechanisms leading to organ regeneration. The combination of gene editing methodologies with defined protocols for tissue differentiation helps us to generate in vitro systems for drug screening and disease modelling. One of our aims is to generate and correct disease-specific hiPSCs for disease modelling and drug screening. 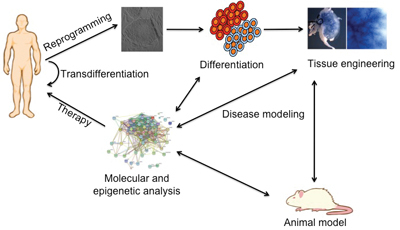 The combination of gene-editing based methodologies together with the development of novel protocols for cell differentiation into relevant tissues/organs, provides a unique scenario for modelling disease progression, and the identification of molecular and cellular mechanisms leading to organ regeneration (Figure 1). In this regard we are particularly interested in generation of transgene-free and disease free patient derived hiPSCs for disease modelling and the discovery of novel therapeutic targets. We believe that the recovery of tissue function should not be restricted to the development of cell replacement therapies. In this regard, in our laboratory we take advantage of organisms that possess the ability to regenerate such as zebrafish, in order to understand which molecular and cellular pathways lead to organ regeneration. Surprisingly, studies in neonatal mice have demonstrated that soon after birth this organism posses the capability to regenerate its heart. Taking advantage of such preliminary observations we are translating such analysis in order to understand if the mammalian neonatal kidney still posses the capability to regenerate, and more importantly, if we are able to dissect the epigenetic and cellular mechanisms leading to those responses. Lastly, and in an effort to fully develop in vitro and ex vivo platforms for organ regeneration, in our lab we are focused in the development of reporter cell lines for different transcription factors essential for tissue-specific commitment and differentiation (i.e: renal and cardiac lineages). The possibility to combine pluripotent stem cell lines together with decellularized matrices, functionalized biomaterials and ex vivo organoids offers and unprecedented opportunity for the immediate generation of patient-specific in vitro and ex vivo platforms for disease modelling and organ regeneration (Figure 2). Figure 2: Induced pluripotent stem cells (iPSCs) resemble human embryonic stem cells (hESCs) in their ability to generate cells of the three germ layers of the embryo. This capacity can help us to understand the molecular and cellular cues driving cell fate. Our aim is to generate reporter cell lines from patient iPSCs in order to develop robust protocols for pluripotent stem cells differentiation. Moreover, the combination of patient differentiated populations together with functionalized biomaterials, ex vivo approaches (i.e: organoids), and decellularized tissue matrices, offers and unprecedented strategy for organ regeneration. Yesterday Betevé’s Deuwatts programme featured IBEC’s Nuria Montserrat talking about organ regeneration. One of the most enviable features of superheroes is their ability to stretch their bodies beyond imaginable limits. In a study published today in Nature, scientists have discovered that our cells can do just that. On Sunday Elena Garreta, a senior researcher in Nuria Montserrat’s Pluripotency for Organ Regeneration group, was interviewed on RAC1 about the uses and possibilities of 3D bioprinting. Federico González Grassi, a senior researcher in the Pluripotency for organ regeneration group, recently gave an interview to Scitech Europa, a website that provides news and developments from the European science and technology community. Nuria Montserrat features in a long article in Quo magazine. In an article in El Periodico on Friday, five Barcelona-based scientists – including IBEC’s Josep Samitier, Nuria Montserrat and Paul Verschure – took stock of the possibilities of disciplines such as bioengineering and robotics to regenerate, recycle or even create life. An IBEC group’s project was granted funding from the Fundación Científica de la Asociación Española Contra el Cáncer in their 2017 Ayudas LAB AECC call. Nuria Montserrat features in an article in El Periodico today which discusses the possibilities offered by 3D bioprinting to create replacement tissues or even whole organs. Yesterday IBEC appeared on Canal 33’s “El día de demà” programme in an episode about disease. Yesterday, La Sexta broadcast the documentary “El futuro en 3D” about the different options offered by 3D printing. An article about Nuria Montserrat appeared in El Mundo on Tuesday following her invovlement in a recent study in which the first human heart grafts from human pluripotent stem cells were generated. In El Periodico today, there’s a four-page article about Catalonia’s ‘champion scientists’. In the magazine Ara, IBEC group leader Nuria Montserrat and artist Marcel·lí Antúnez, who creates interactive sculpture with organic materials, such as Joan l’Home de Carn, appeared in an article together talking about organ regeneration. Researchers at the Hospital Clínic, IDIBAPS, the Hospital Sant Joan de Deu and the Institute for Bioengineering of Catalonia (IBEC) have participated in a study, led by Dr. Juan Carlos Izpisúa Belmonte of the Gene Expression Laboratory at California’s Salk Institute, that uses molecular “scissors” to remove mitochondrial mutations in mouse eggs. New IBEC group leader Nuria Montserrat is featured in an article in El Mundo. PURPOSE OF REVIEW: The goal of this paper is to highlight the major challenges in the translation of human pluripotent stem cells into a clinical setting. RECENT FINDINGS: Innate features from human induced pluripotent stem cells (hiPSCs) positioned these patient-specific cells as an unprecedented cell source for regenerative medicine applications. Immunogenicity of differentiated iPSCs requires more research towards the definition of common criteria for the evaluation of innate and host immune responses as well as in the generation of standardized protocols for iPSC generation and differentiation. The coming years will resolve ongoing clinical trials using both human embryonic stem cells (hESCs) and hiPSCs providing exciting information for the optimization of potential clinical applications of stem cell therapies. SUMMARY: Rapid advances in the field of iPSCs generated high expectations in the field of regenerative medicine. Understanding therapeutic applications of iPSCs certainly needs further investigation on autologous/allogenic iPSC transplantation. Cardiovascular disease (CVD) is still the leading cause of death worldwide, but the knowledge and technologies for counteracting this disease may already be in our hands. Scientific advances over the past few years, such as the isolation and differentiation of induced pluripotent stem cells, and the development of gene-editing tools, have enabled us to model CVD, but more importantly, may represent tools for CVD early diagnosis, patient stratification, and treatment. This monograph, written by the pioneers of IVF and reproductive medicine, celebrates the history, achievements, and medical advancements made over the last 40 years in this rapidly growing field. Understanding epigenetic mechanisms is crucial to our comprehension of gene regulation in development and disease. In the past decades, different studies have shown the role of epigenetic modifications and modifiers in renal disease, especially during its progression towards chronic and end-stage renal disease. Thus, the identification of genetic variation associated with chronic kidney disease has resulted in better clinical management of patients. Despite the importance of these findings, the translation of genotype–phenotype data into gene-based medicine in chronic kidney disease populations still lacks faithful cellular or animal models that recapitulate the key aspects of the human kidney. The latest advances in the field of stem cells have shown that it is possible to emulate kidney development and function with organoids derived from human pluripotent stem cells. These have successfully recapitulated not only kidney differentiation, but also the specific phenotypical traits related to kidney function. The combination of this methodology with CRISPR/Cas9 genome editing has already helped researchers to model different genetic kidney disorders. Nowadays, CRISPR/Cas9-based approaches also allow epigenetic modifications, and thus represent an unprecedented tool for the screening of genetic variants, epigenetic modifications or even changes in chromatin structure that are altered in renal disease. In this Review, we discuss these technical advances in kidney modeling, and offer an overview of the role of epigenetic regulation in kidney development and disease. Kidney morphogenesis and patterning have been extensively studied in animal models such as the mouse and zebrafish. These seminal studies have been key to define the molecular mechanisms underlying this complex multistep process. Based on this knowledge, the last 3 years have witnessed the development of a cohort of protocols allowing efficient differentiation of human pluripotent stem cells (hPSCs) towards defined kidney progenitor populations using two-dimensional (2D) culture systems or through generating organoids. Kidney organoids are three-dimensional (3D) kidney-like tissues, which are able to partially recapitulate kidney structure and function in vitro. The current possibility to combine state-of-the art tissue engineering with clustered regularly interspaced short palindromic repeats (CRISPR)/CRISPR-associated systems 9 (Cas9)-mediated genome engineering provides an unprecedented opportunity for studying kidney disease with hPSCs. Recently, hPSCs with genetic mutations introduced through CRISPR/Cas9-mediated genome engineering have shown to produce kidney organoids able to recapitulate phenotypes of polycystic kidney disease and glomerulopathies. This mini review provides an overview of the most recent advances in differentiation of hPSCs into kidney lineages, and the latest implementation of the CRISPR/Cas9 technology in the organoid setting, as promising platforms to study human kidney development and disease. Discarded human donor organs have been shown to provide decellularized extracellular matrix (dECM) scaffolds suitable for organ engineering. The quest for appropriate cell sources to satisfy the need of multiple cells types in order to fully repopulate human organ-derived dECM scaffolds has opened new venues for the use of human pluripotent stem cells (hPSCs) for recellularization. In addition, three-dimensional (3D) bioprinting techniques are advancing towards the fabrication of biomimetic cell-laden biomaterial constructs. 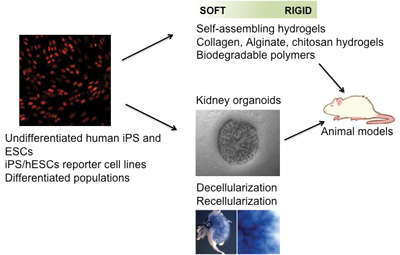 Here, we review recent progress in decellularization/recellularization and 3D bioprinting technologies, aiming to fabricate autologous tissue grafts and organs with an impact in regenerative medicine. Anatomical and/or functional reentries have been proposed as one of the main mechanism of perpetuation of cardiac fibrillation processes. However, technical limitations have difficult the characterization of those reentries and are hampering the development of effective anti-arrhythmic treatments. The goal of this study is to present a novel technology to map with high resolution the center of fibrillation drivers in order to characterize the mechanisms of reentry. Cell cultures of human cardiac-like cells differentiated from pluripotent stem cells were analyzed with a novel microscopic optical mapping system. The pharmacological response to verapamil administration of each type of reentry was analyzed. In all analyzed cell cultures, a reentry was identified as the mechanism of maintenance of the arrhythmia. Interestingly, the administration of verapamil produced opposite effects on activation rate depending on the mechanisms of reentry (i.e. anatomical or functional). Microscopic optical mapping of reentries allows the identification of perpetuation mechanisms which has been demonstrated to be linked with different pharmacological response. Recent advances in the generation of skeletal muscle derivatives from pluripotent stem cells (PSCs) provide innovative tools for muscle development, disease modeling, and cell replacement therapies. Here, we revise major relevant findings that have contributed to these advances in the field, by the revision of how early findings using mouse embryonic stem cells (ESCs) set the bases for the derivation of skeletal muscle cells from human pluripotent stem cells (hPSCs) and patient-derived human-induced pluripotent stem cells (hiPSCs) to the use of genome editing platforms allowing for disease modeling in the petri dish. We have known for decades that it is possible to switch the phenotype of one somatic cell type into another. Such epigenetic rewiring processes can be artificially managed and even reversed by using a defined set of transcription factors. Lineage reprogramming is very often defined as a process of converting one cell type into another without going through a pluripotent state, providing great promise for regenerative medicine. However, the identification of key transcription factors for lineage reprogramming is limited, due to the exhaustive and expensive experimental processes. Accumulating knowledge of genetic and epigenetic regulatory networks that are critical for defining a specific lineage provides unprecedented opportunities to model and predict pioneering factors that may drive directional lineage reprogramming to obtain the desired cell type. Abstract: Epigenetic reprogramming is a central process during mammalian germline development. Genome-wide DNA demethylation in primordial germ cells (PGCs) is a prerequisite for the erasure of epigenetic memory, preventing the transmission of epimutations to the next generation. Apart from DNA demethylation, germline reprogramming has been shown to entail reprogramming of histone marks and chromatin remodelling. Contrary to other animal models, there is limited information about the epigenetic dynamics during early germ cell development in humans. Here, we provide further characterization of the epigenetic configuration of the early human gonadal PGCs. We show that early gonadal human PGCs are DNA hypomethylated and their chromatin is characterized by low H3K9me2 and high H3K27me3 marks. Similarly to previous observations in mice, human gonadal PGCs undergo dynamic chromatin changes concomitant with the erasure of genomic imprints. Interestingly, and contrary to mouse early germ cells, expression of BLIMP1/PRDM1 persists in through all gestational stages in human gonadal PGCs and is associated with nuclear lysine-specific demethylase-1. Our work provides important additional information regarding the chromatin changes associated with human PGCs development between 6 and 13 weeks of gestation in male and female gonads. The most frequent rearrangement of the human MLL gene fuses MLL to AF4 resulting in high-risk infant B-cell acute lymphoblastic leukemia (B-ALL). MLL fusions are also hallmark oncogenic events in secondary acute myeloid leukemia. They are a direct consequence of mis-repaired DNA double strand breaks (DNA-DSBs) due to defects in the DNA damage response associated with exposure to topoisomerase-II poisons such as etoposide. It has been suggested that MLL fusions render cells susceptible to additional chromosomal damage upon exposure to etoposide. Conversely, the genome-wide mutational landscape in MLL-rearranged infant B-ALL has been reported silent. Thus, whether MLL fusions compromise the recognition and/or repair of DNA damage remains unanswered. Here, the fusion proteins MLL-AF4 (MA4) and AF4-MLL (A4M) were CRISPR/Cas9-genome edited in the AAVS1 locus of HEK293 cells as a model to study MLL fusion-mediated DNA-DSB formation/repair. Repair kinetics of etoposide- and ionizing radiation-induced DSBs was identical in WT, MA4- and A4M-expressing cells, as revealed by flow cytometry, by immunoblot for γH2AX and by comet assay. Accordingly, no differences were observed between WT, MA4- and A4M-expressing cells in the presence of master proteins involved in non-homologous end-joining (NHEJ; i.e.KU86, KU70), alternative-NHEJ (Alt-NHEJ; i.e.LigIIIa, WRN and PARP1), and homologous recombination (HR, i.e.RAD51). Moreover, functional assays revealed identical NHEJ and HR efficiency irrespective of the genotype. Treatment with etoposide consistently induced cell cycle arrest in S/G2/M independent of MA4/A4M expression, revealing a proper activation of the DNA damage checkpoints. Collectively, expression of MA4 or A4M does neither influence DNA signaling nor DNA-DSB repair. The kidney is the most important organ for water homeostasis and waste excretion. It performs several important physiological functions for homeostasis: it filters the metabolic waste out of circulation, regulates body fluid balances, and acts as an immune regulator and modulator of cardiovascular physiology. The development of in vitro renal disease models with pluripotent stem cells (both human embryonic stem cells and induced pluripotent stem cells) and the generation of robust protocols for in vitro derivation of renal-specific-like cells from patient induced pluripotent stem cells have just emerged. Here we review major findings in the field of kidney regeneration with a major focus on the development of stepwise protocols for kidney cell production from human pluripotent stem cells and the latest advances in kidney bioengineering (i.e. decellularized kidney scaffolds and bioprinting). The possibility of generating renal-like three-dimensional structures to be recellularized with renal-derived induced pluripotent stem cells may offer new avenues to develop functional kidney grafts on-demand. Abstract: Because of their extraordinary differentiation potential, human pluripotent stem cells (hPSCs) can differentiate into virtually any cell type of the human body, providing a powerful platform not only for generating relevant cell types useful for cell replacement therapies, but also for modeling human development and disease. Expanding this potential, structures resembling human organs, termed organoids, have been recently obtained from hPSCs through tissue engineering. Organoids exhibit multiple cell types self-organizing into structures recapitulating in part the physiology and the cellular interactions observed in the organ in vivo, offering unprecedented opportunities for human disease modeling. To fulfill this promise, tissue engineering in hPSCs needs to be supported by robust and scalable genome editing technologies. With the advent of the CRISPR/Cas9 technology, manipulating the genome of hPSCs has now become an easy task, allowing modifying their genome with superior precision, speed, and throughput. Here we review current and potential applications of the CRISPR/Cas9 technology in hPSCs and how they contribute to establish hPSCs as a model of choice for studying human genetics. Mitochondrial diseases include a group of maternally inherited genetic disorders caused by mutations in mtDNA. In most of these patients, mutated mtDNA coexists with wild-type mtDNA, a situation known as mtDNA heteroplasmy. Here, we report on a strategy toward preventing germline transmission of mitochondrial diseases by inducing mtDNA heteroplasmy shift through the selective elimination of mutated mtDNA. As a proof of concept, we took advantage of NZB/BALB heteroplasmic mice, which contain two mtDNA haplotypes, BALB and NZB, and selectively prevented their germline transmission using either mitochondria-targeted restriction endonucleases or TALENs. In addition, we successfully reduced human mutated mtDNA levels responsible for Leber?s hereditary optic neuropathy (LHOND), and neurogenic muscle weakness, ataxia, and retinitis pigmentosa (NARP), in mammalian oocytes using mitochondria-targeted TALEN (mito-TALENs). Our approaches represent a potential therapeutic avenue for preventing the transgenerational transmission of human mitochondrial diseases caused by mutations in mtDNA. Mitochondrial diseases include a group of maternally inherited genetic disorders caused by mutations in mtDNA. In most of these patients, mutated mtDNA coexists with wild-type mtDNA, a situation known as mtDNA heteroplasmy. Here, we report on a strategy toward preventing germline transmission of mitochondrial diseases by inducing mtDNA heteroplasmy shift through the selective elimination of mutated mtDNA. As a proof of concept, we took advantage of NZB/BALB heteroplasmic mice, which contain two mtDNA haplotypes, BALB and NZB, and selectively prevented their germline transmission using either mitochondria-targeted restriction endonucleases or TALENs. In addition, we successfully reduced human mutated mtDNA levels responsible for Leber?s hereditary optic neuropathy (LHOND), and neurogenic muscle weakness, ataxia, and retinitis pigmentosa (NARP), in mammalian oocytes using mitochondria-targeted TALEN (mito-TALENs). Our approaches represent a potential therapeutic avenue for preventing the transgenerational transmission of human mitochondrial diseases caused by mutations in mtDNA.